American Retail Supply offers many different types of Tagging Guns. Tagging guns are used to tag soft goods with a needle and fasteners (barbs). The two basic types are TG Tacher and Tach IT. American Retail Supply offer a 1 year warranty on all tagging guns. Please contact us to speak with a product expert at 800-426-5708. Standard tools use standard needles and fasteners. These tagging guns are used for marking items such as towels, pillows, stuffed animals and much more. Extra thick or heavy items may require a heavy-duty needle. 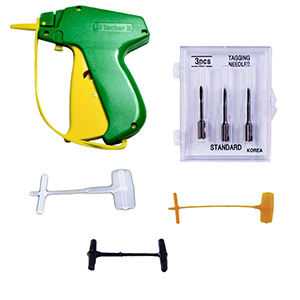 Heavy Duty needles fit into a standard tagging gun. All brands of standard fasteners are interchangeable with other brand of taggers. Standard fasteners for tagging guns come in 3/4"-5". We offer white, colored and hook fasteners. We have standard reinforced needle and heavy-duty needles. Needles may not be interchangeable. Fine tagging guns use fine needles and fine fasteners. These tagging guns are used for tagging anything t-shirt thickness or finer. Fine taggers are ideal for silk, satin or lace. All brands of fine fasteners may be used with any fine tagging gun. We offer 3/4"- 3" fasteners in fine. We also have fine tagging needles and reinforced fine tagging needles.